We work in partnership with HazardCo to uphold and maintain our health and safety standards. Providing a safe place to work, safe equipment, and proper materials. Establishing and insisting that safe work methods are practiced at all times. Providing regular supervision, induction,and training of employees. Ensuring all staff understand and accept responsibility to promote and maintain a safe and healthy place of work. Ensuring all contractors who work on site have a suitable and approved Health Safety Programme. Ensuring safe access to the house is maintained at all times if the owners are still living in the house. Quality workmanship delivered on time and on budget. 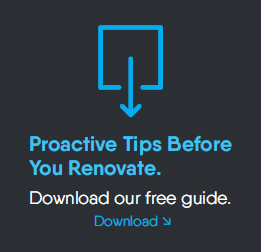 PROACTIVE TIPS BEFORE RENOVATING. DOWNLOAD your FREE GUIDE.